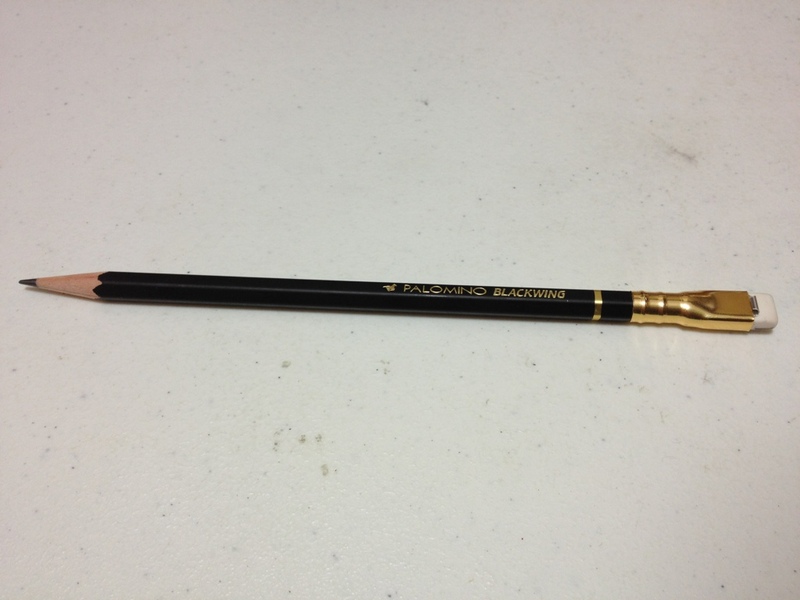 So I’ve reviewed some pencils, and I believe it is time in my pencil-reviewing career to take a look at the reproduction of the “greatest” pencil of all time: The Palomino Blackwing. The body of the pencil is unique, which really is something to say about a pencil. The main body is a fairly standard hexagon shape, but painted in a nice, less-standard matte black. 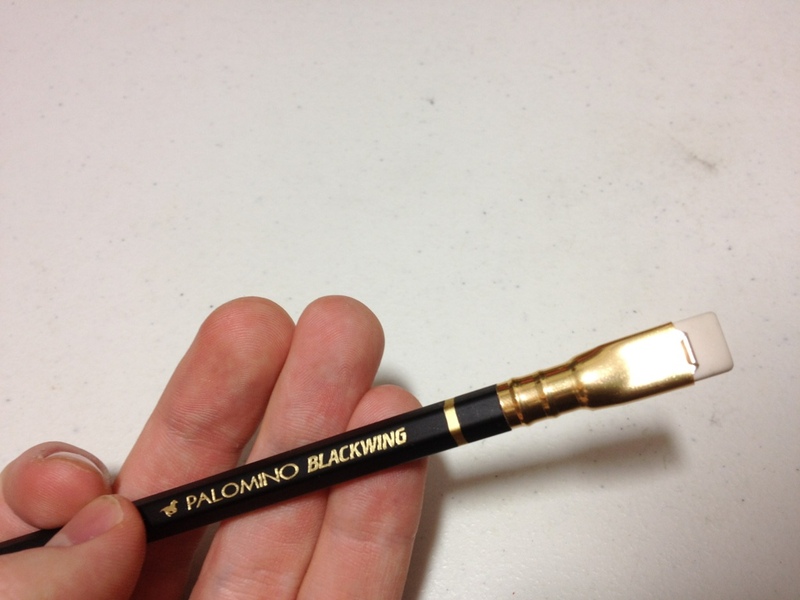 The Palomino Blackwing name and logo is printed in gold, with a gold band around the back. No indication of hardness is presented. The eraser holder starts off normal, but flares out into a rectangular shape with a metal insert that holds the eraser and makes it replaceable. This eraser holder is fairly smoothly finished, which is also unconventional. The erasers themselves are fine, they get the job done but they aren’t perfect, especially if they have to deal with the amount of lead this pencil puts on the paper. 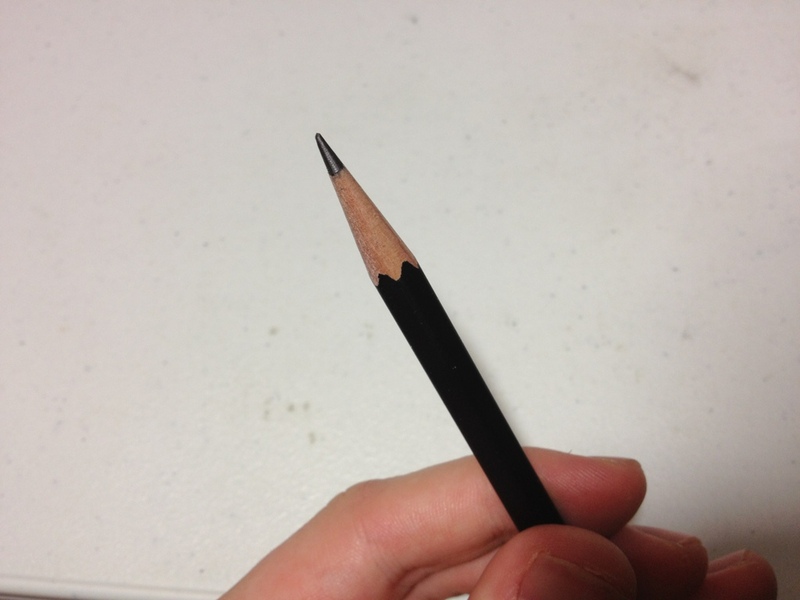 Now to what really matters: the lead of the pencil. It is fairly soft, but not the softest. From what I can gather it’s about a 3 or 4B (a few bits softer than a no.1 or no. 2 pencil) and boy does it glide. It’s likely one of the best flowing pencils I’ve ever used. Even for this hardness it is noticeably smoother than others in the same area. But it does sacrifice its point for this. The pencil just never stays sharp, and it can go from a fine (almost) line to a very broad line very fast. The softness also makes sharpening harder as the end never gets quite as sharp as I’d like it to be as it keeps breaking off. I suspect that the Blacking will be reduced to a stump in short order because of this, and the eraser likely never be used to its fullest. Overall I’d say that the Blackwing is a superb pencil, but just not my type. It is well constructed, has convenient ideas and is super smooth. But I prefer more precision in my writing and drawing and need a finer point for that. I’m also no a fan of the darkness that softer pencils provide. I like being a little more in control and a little bit lighter. That said, the shading is amazing and the tonal range is phenomenal. It wouldn’t be my greatest pencil of all time, but I can see how it would easily be someone’s. This entry was posted in Advanced Supplies, Utensils and tagged 3B, blackwing, blackwing pencil, greatest pencil, palomino blackwing, pencil, review by Dragon Co (Austin Smith). Bookmark the permalink.